The Sabres’ Matt D’Agostini (27) celebrates his game-winning goal in overtime after Matt Moulson tied it in regulation in Buffalo’s 5-4 win. 5-4mwimn. Jhonas Enroth still shares a dressing room with Ryan Miller, so he chose to defer to Miller on Wednesday when the future of the Sabres’ crease came up in conversation. While it’s respectful of Enroth to remain in Miller’s shadow, it doesn’t change the fact that Buffalo’s No. 1 goalie has one skate out the door. It’s a near certainty Miller will be traded by the deadline Wednesday, so someone has to become the starter for the final 23 games of the season. 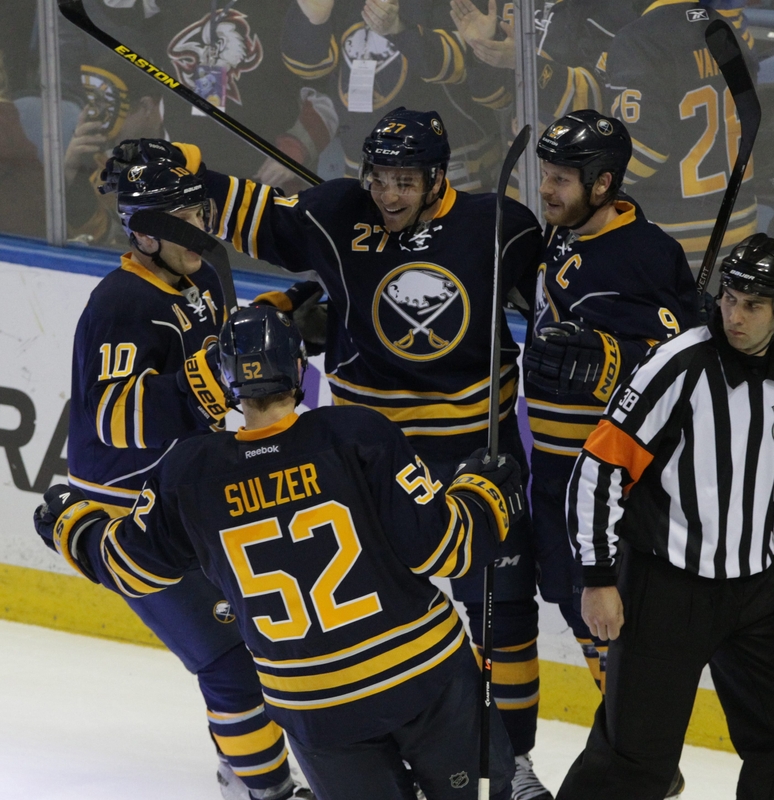 Enroth finally put another win on his resume with a 5-4 overtime victory over Boston in First Niagara Center. He made 29 saves to improve to 2-12-5. It was his first victory since a 3-1 decision Oct. 25 in Florida, and it was made possible when Matt Moulson tied the game with 52.3 seconds left and Matt D’Agostini ended it 22 seconds into overtime. The Sabres are expected to make a number of trades in the next week, and it’s likely a goalie will come to Buffalo in the transactions. One will be needed because the Sabres’ minor-league netminders – Nathan Lieuwen and Matt Hackett – aren’t ready for NHL work. Amerks coach Chadd Cassidy concurred Wednesday. Hackett is 23 years old and has played 178 professional games, including 13 in the NHL. Lieuwen, 22, has played 56 games in the minors. Hackett may be more familiar to Sabres fans because he came to the organization in the Jason Pominville trade, but Lieuwen is surging up the depth chart. The 22-year-old AHL rookie is 14-7-2 with a 2.40 goals-against average and .920 save percentage, including a 2.06 and .932 since December. “Nathan Lieuwen has been a really outstanding surprise,” Cassidy said of the Sabres’ sixth-round draft pick in 2011. “He really is developing nicely and has taken the ball and run with it in terms of the opportunity that we’ve given him. Hackett, who appeared in one game for Minnesota last year before being dealt to Buffalo, hasn’t shown he’s ready for his next NHL game. He’s 13-14-2 with a 2.78 GAA and .907 save percentage. Though Lieuwen and Hackett are younger and less experienced than the 25-year-old Enroth, they do have one advantage. Lieuwen is 6-foot-5 and Hackett is 6-2. Enroth is 5-10. The most important thing will be to find a goalie who can come up big when Miller is gone.